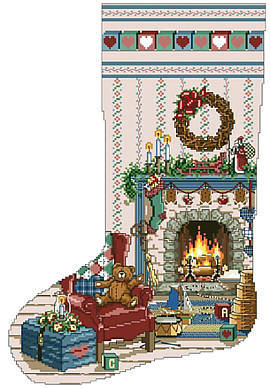 Home For Christmas is another of our coveted Heirloom Stockings designed by Sandy Orton. This favorite shows a Victorian style room with cozy fireplace crackling away with décor, candles, wreaths, toys and other holiday cheer filling the inviting room. Personalize this classic heirloom for a favorite family member. Contents: Stitch Count 136w X 210h, Finished size on 14 ct 9-3/4" X 15"